Missing teeth not only affect appearance, they also affect mouth function. A missing tooth can have a negative impact on your bite and can cause discomfort, decay and gum disease. There are a number of excellent options available to replace missing teeth including dental implants, bridges and partial dentures. Talk to Robert Duhig Dental Brisbane about the best option to restore your teeth, and your smile, to full working order. Titanium dental implants are the standard option to replace missing teeth, especially if the adjacent teeth are healthy and untreated. 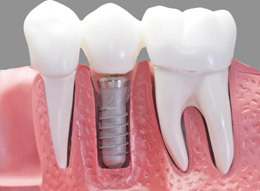 Implants improve dental function, alleviate problems caused by ill fitting plastic teeth, and restore lost confidence. The implant is inserted into the bone and both implant and bone form a strong bond. 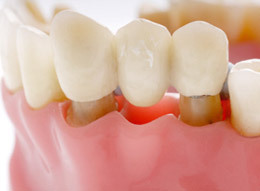 Crowns, bridges or plastic teeth can then be permanently secured to the implant. This eliminates the need for removable plastic dentures which can be annoying and uncomfortable. A fixed bridge is an option when one to three teeth need replacing and if the adjacent teeth have had previous fillings. The results can be excellent in restoring function and cosmetic appeal. A false tooth is suspended from your natural adjacent teeth which have been reduced in size to fit the bridge. 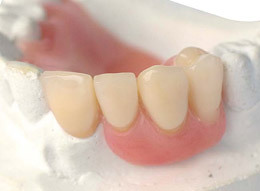 Bridges are specially fabricated from a dental impression and are cemented permanently in place. With regular maintenance, a well made bridge can last for many years and can only be removed by a dentist. Alternatively, bonded bridges can be used. This process involves the removal of less tooth structure than in a fixed bridge procedure. The bridge is bonded to the area of the natural tooth that has been reduced. A partial denture is removable by the patient and requires regular cleaning. They are usually left out of the mouth at night. A partial denture is an option when several teeth are missing, or when finances don’t permit a more comprehensive solution. As the denture base needs to be extended around other teeth so it stays in place when the patient is eating, it can feel very bulky in the mouth. Some patients can tolerate this, while others find it uncomfortable. Dentures also increase plaque in the mouth, and therefore the risk of tooth decay and gum disease.